I spotted this sign a number of times in Boston this week. It is aimed at cars… But I think it truly captures the sentiment of the day. My road to Boston was a long one: 2 years spent “chasing the unicorn”, as they call it. In 2012, I first set out to qualify. The time I needed was 3:35. 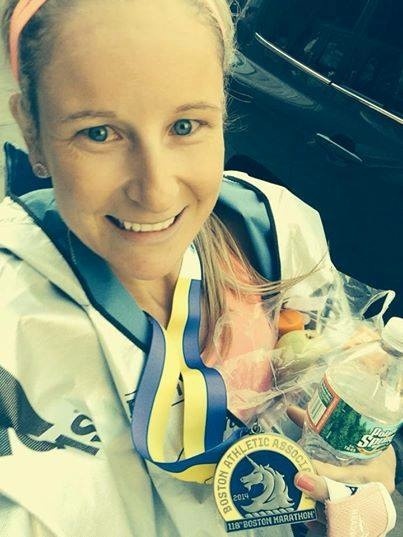 I ran 3:35:27 in Sydney, missing out by 27 seconds on a spot in the 2013 race. On the 14th April 2013, I ran my ‘BQ’ in the Canberra Marathon, in a time of 3:28:02, nearly 7 minutes inside my qualifying time. But qualifying is just the first step, you still need to go through the registration process. As I went to bed that night, preparations were well under way on the other side of the world for the 117th Boston Marathon. On the 15th April 2013, at 2:49pm, 2 bombs were set off near the finish line, killing 3 and injuring 260 more. Numerous people asked me if I still wanted to do the race. This tragic event only increased my desire to make it to Boston the following year. I had a feeling it was going to be the biggest race ever. The race organisers declared they expected unprecedented demand on the 2014 race. Because of this, they changed the entry process. An extra 9000 spots were on offer, bringing the field size to 36 000. 4500 of those spots were given to the runners who did not get to finish the race last year. When entry opened at the end of September, you could only apply if you had beaten your qualifying time by 20 minutes. I started to worry that the 7 minute buffer that I had given myself was not going to be enough. 2 anxious days later, entry was opened up to those runners who were 10 minutes inside their qualifying time. On the 5th day, runners who had beaten their qualifying time by 5 minutes could apply. I was successful. Boston here I come! 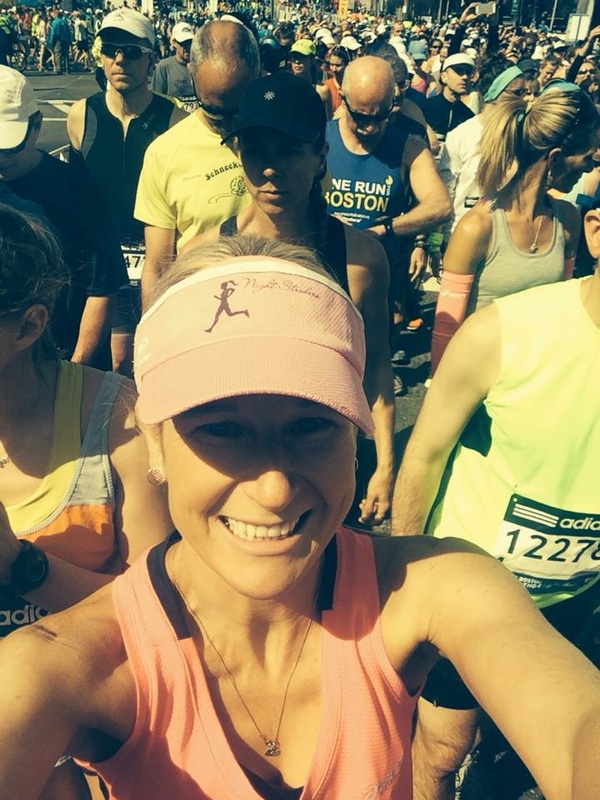 I arrived in Boston 2 days before race day, weary, dehydrated, and jet-lagged from the travel. I checked into a room at the Boston HI, which was filled with runners, and others who had travelled to Boston to volunteer for the race – over 8000 people volunteer each year. Like the athletes, the volunteers also come from near and far. For many, it is an annual pilgrimage. But it’s not a requirement. I did not put my name on my shirt, but that did not stop random strangers from cheering me on with encouragement like “go pink top”, “yeah blondie, you’re killing it!”, or “go the girl in the pink socks!”. Yellow buses on Boston Common. At 7am I left my hostel and headed a couple of short blocks towards Boston common, where I would catch the bus out to the start line in Hopkinton. It was truly a sight to see, hundreds of yellow ‘magic school buses’ travelling down the road in succession. Because of all the road closures we had to go the long way around, but we finally arrived at the school, where the waiting game began. At 9.50, the runners in wave 2 (my wave) were called to the start line. I was stuck in a long toilet queue. I was not in a hurry, as my wave didn’t start until 10:25. I wandered over in my own time, and by the time I arrived at the starting corrals, my wave had already started. Not to worry, there were around 10 000 people in my wave. I was happy to be at the back, where it was less crowded. I walked towards the start line. As I crossed it, I started my Garmin, nearly 40 minutes after the official start of the race. I was away. The course starts on Main Street, in the rural New England town of Hopkinton. From there, it makes its way through Ashland, Framingham, Natick, Wellesley, Newton and Brookline, before finishing in Copley Square, Boston. There are only 2 turns in the race, both in the final kilometre. 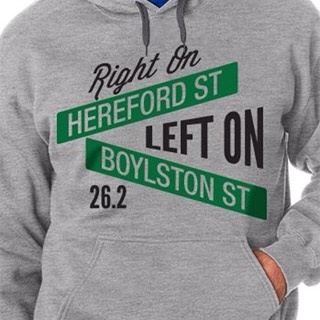 “Right on Hereford, left on Boylston”, as the saying goes. Looking at the course profile, I did not think it would be possible to run an evenly paced race. As I wanted to run a PB, I thought I had better come up with a plan. My plan was to run as close to 4:45 min kilometres as I could at the start of the race, where I had the downhill on my side, for the first 15km or so. The next 7 or 8 km just kind of roll, and then come the 4 ‘Newton Hills’, culminating in Heartbreak hill, which painfully falls right at the 32 kilometre mark. After that, it’s mostly downhill to the finish, so you’d better hope you didn’t completely grind your quads to a pulp in the first 15km, because you are going to need them here. I allowed time for a blowout on heartbreak hill (kilometre 32), and even if I never fully recovered after the 4 ‘newton hills’ in the second half of the race, I should still scrape in for a PB If I could manage to maintain sub 5-minute kilometres through until the end. Boston marathon course profile. Sorry it’s in miles… That’s how they do things here. From the start, it was downhill. Unfortunately, with 10 000 other people in my wave, the start of the race was not the best spot to take advantage of a lot of downhill. There were people everywhere. On the course, and on the sidelines. I really have not seen anything like it. EVERYONE came out to watch the race. For the first few kilometres, they were 10-deep on the sidelines, cheering for you. There were official water stations every mile, but people were standing everywhere handing out ice, paper towel, twizzlers, Vaseline on paddle pop sticks, popsicles, and anything else a perfect stranger might require mid-race. 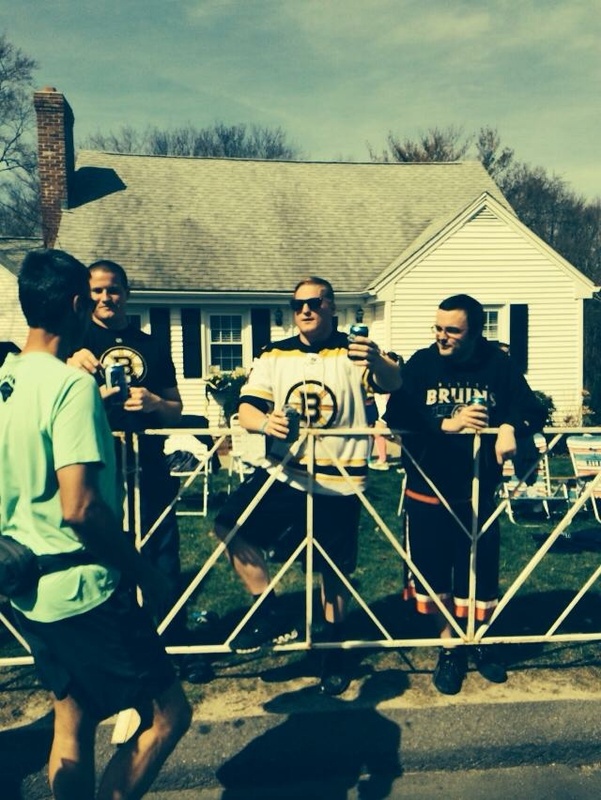 Spectators, including these Boston Bruins fans, lined the entire course. The first 10km was a blur of adrenaline, nervous energy and emotion. The first half of the race went by relatively easily. I was feeling good, and racing my plan. I ran through the “Wellesley College scream tunnel”, where all the college girls were out in force to cheer on the runners. 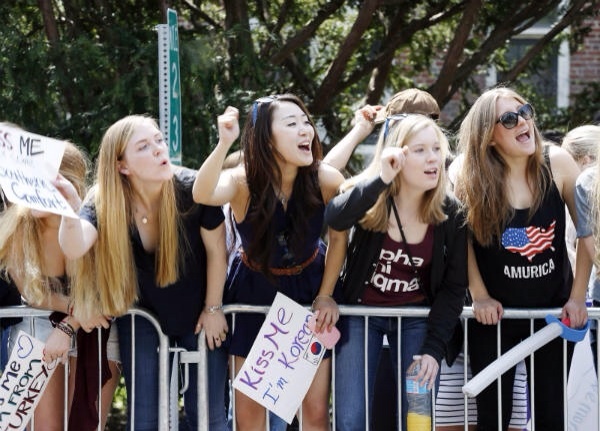 They all held “Kiss me” signs, hoping to steal kisses from the passing marathoners. “Kiss me, I’m good at it”. “Kiss me, I’m from Idaho”. “Kiss me, I’m 6 ft tall”. “Kiss me, I play video games”. “Kiss me if you’re Canadian”. “Kiss me, I swing both ways”. I didn’t stop for a kiss. It was also about this point that I started to notice signs in the crowd that read “Meb Won!” In a time of 2:08:37, American Meb Keflezighi had been the first runner to break the finish-line tape since 1983… And did so wearing a pair of Skechers running shoes. Next came the Newton Hills, one of the Boston Marathon’s signature challenges. It is a series of 4 hills over 8km, including the famed ‘Heartbreak Hill, at kilometre 32. As you crest heartbreak hill, you can see another hill in the distance. It is also known as ‘you’ve got to be kidding me’ hill. It is not so much the size of the hills, as where they fall in the race that poses the biggest problem. They came right as I was starting to struggle with the warm day. 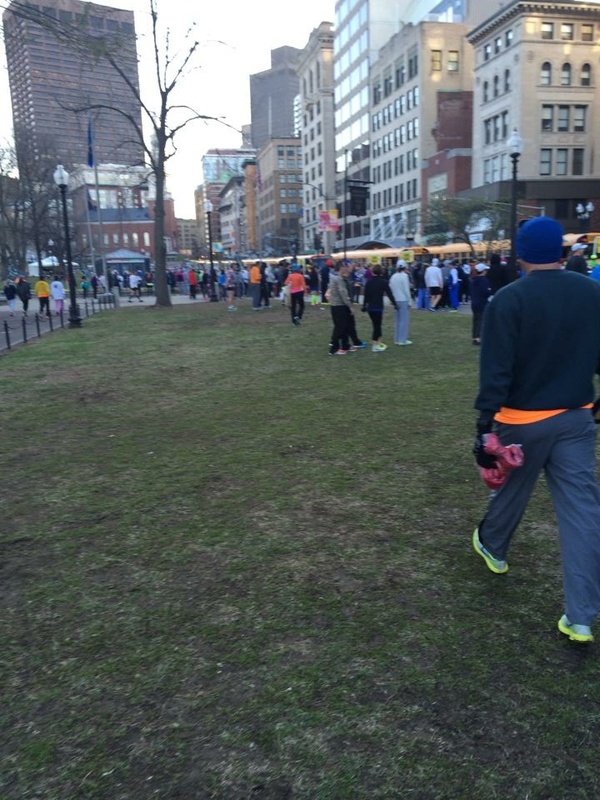 For some reason, I had it in my head that Boston was going to be a quick, flat course. I was wrong. I had looked at Boston-specific marathon training plans, and conveniently ignored the fact they all had hill sessions in them. “I run up memorial drive nearly every day” I told myself. And, “I just did 6 foot track… These hills have got nothing on that. I won’t even notice them”. As I passed the 32km mark, my quads were screaming at me, “hey! Remember that really hilly trail ultra marathon you did a few weeks back? Well, we haven’t recovered from that yet!” . I started to have a salt tablet every few kilometres, worried that my quads were going to give up any minute. I knew I was still on track for a PB, but worried I had not left myself enough room for how much I thought I was fading. The uphill was bad, but the downhill was even worse, as my quads were pounding with every step. At around the 35km mark I entered what is known as the ‘meat grinder mile’, and that’s a pretty accurate description of what I felt it was doing to my quads. I was searching for water at every aid station, as I was feeling very dehydrated and my mouth was completely dry. My lips were sticking to my teeth. 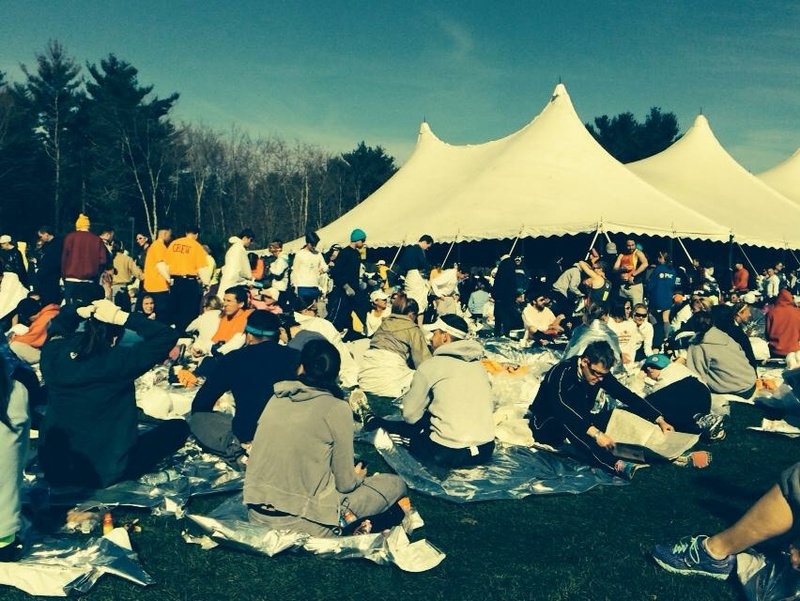 Every aid station was chaos. Bodies were going everywhere, people were stopping to walk, and I kept running straight into the back of them. I lost 10-15 seconds with every water stop. 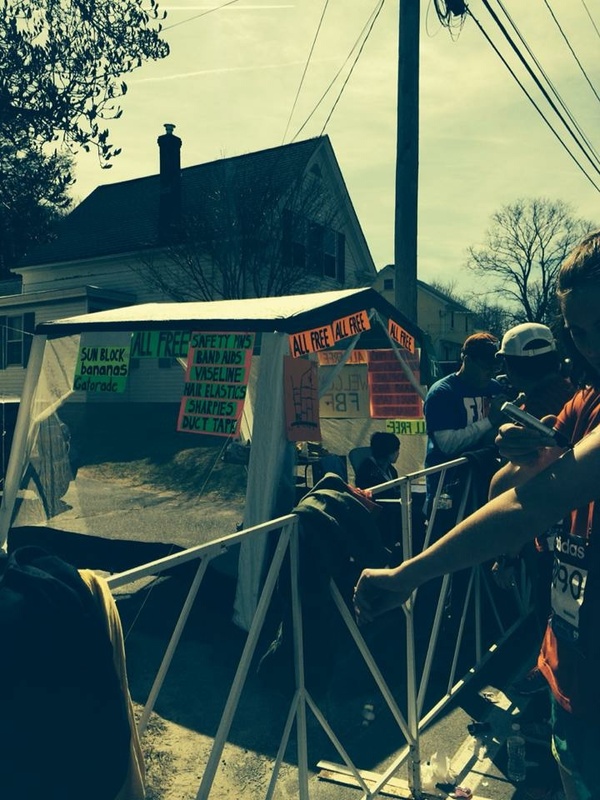 The crowd of runners felt consistent the entire race… It never thinned out. Then I entered Brookline. I contemplated walking. I looked up, and the girl in front of me had “PR or ER” on her shirt, (As in, personal record or emergency room), and it really resonated with me. I thought, “the only thing that is going to stop me running sub-3:25 today is a trip to the hospital”. 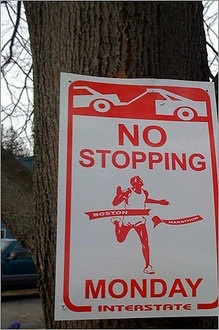 And then I remembered the signs… ‘No stopping on marathon Monday”. I couldn’t stop. The sign said so. There must have been another Australian runner near me at this point too, with a flag or a shirt, or something to identify them as Australian. People in the crowd were cheering “go Aussie”, and I pretended they were cheering for me. Traditionally, on the day of the Boston Marathon, the Boston Red Sox play a home game at Fenway Park at 11:00am. After the game, the crowd spills out into Kenmore Square, and the crowds are huge. This was good news for me, because as I entered the final couple of kilometers, the spectators were everywhere, cheering for thousands of runners they had never seen before, and would probably never see again. I turned the final corner onto Boylston St. The roar from the crowd met my ears. It was electrifying. I could see the finish line in the distance, and tried to dig deep for a couple more minutes. I felt completely spent, but tried to compose myself and throw my arms in the air as I crossed the finish line for my finish line photo. I was done. In 3:21:20. Ecstatic. A PB by more than 5 minutes. I’m standing in Copley Square, surrounded by dozens of other space blanket-clad warriors, and volunteer puts my unicorn finishers medal around my neck. My dream of 2 years has finally been realized. Because I had travelled across the world for this race, I had no friends or family there. I was very thankful for the hundreds of thousands of spectators who turned up to cheer, despite the events of the previous year. The same spectators who jumped over the barricades to help the injured after the bombings, and opened their homes to people who were stranded after the blasts. There was an online document of open doors in Boston last year, with over 5000 entries, for complete strangers. From the people who watch. Despite the events of last year, more runners showed up, to run harder. More spectators showed up, to cheer louder. Anybody who thought these bombings might discourage people from coming back the following year has probably never been to watch a marathon. It is a celebration of human strength, determination and tenacity. In the words of Kathrine Switzer, the first woman to ever run the Boston race, “if you are losing faith in human nature, go out and watch a marathon”. I really enjoyed reading your review, I’ve read a few reviews about Boston, but very much enjoyed all the details on yours. Congratulations on a great PR too! Must have been hard going alone all the way from Australia, good for you that you did it! Thank you. I travelled a long way, I was determined to give it all I had! Huge congratulations on your PR. It sounds like you fought to earn the qualification, and you put in the same fight on your way to that super speedy 3:21. I’m always a fan of a great description, and I was particularly drawn to “My lips were sticking to my teeth” — it’s a perfect summary of how spent you were at that time. That meat grinder mile really took it out of you, but not enough to kill your PR hopes. Thanks Dan. I sure felt awful during that meat grinder mile.can’t wait to come back and do it all again. Congratulations on the great time Kirby, those American marathons are amazing events – all the more so after last year. 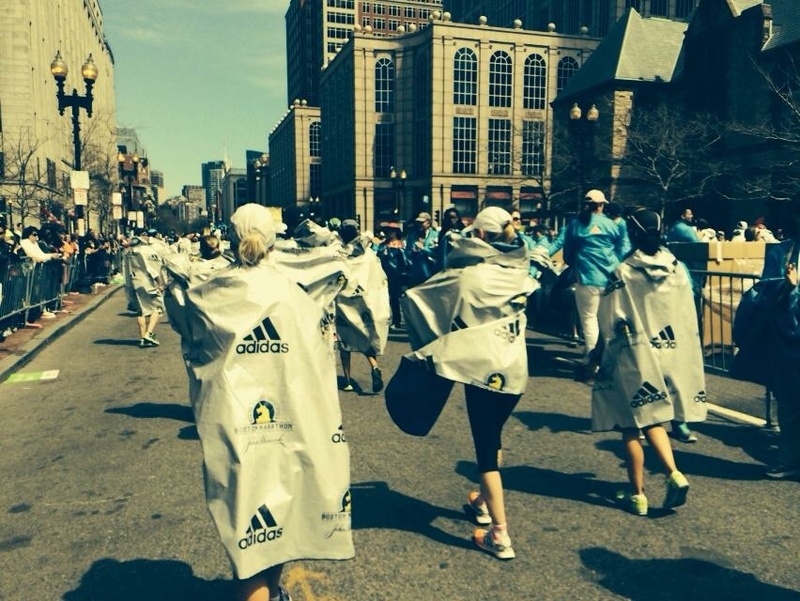 Looks like you were Boston Strong ! Thankyou. Yes, the big American events are certainly in a different league to ours back home! Thanks Kara, can’t wait to be home! Kirby, it was great meeting you at the Boston HI. Congrats on doing a PR that day! It’s a hard race for sure. I looked at the elevation profile and though …”net downhill” therefore “not that hard” …WRONG! Out of 3 marathons now it was my slowest but Wow! such a great experience. The crowds were actually deafening at times. I hope to see you this fall in Oz. Reading this blog brings home the message about why we run. Congratulations Kirby and perhaps the unicorn should become the new ‘Night Striders’ symbol of strength and determination. Best wishes from all 5 runners in the McGaw family. Thanks Dave and the McGaws. I love the unicorn symbol, I will certainly give this medal pride of place! What a beautiful write-up Kirby! You described the events in an incredibly riveting way. It really captures the spirit of long distance running. Congratulations on the unicorn and the awesome PB! Fantastic effort and thanks for sharing the details- fascinating. Good luck with upcoming run and hope you schedule in some quality recovery time soon!